The Konrad Deublerheim is located at the edge of the village center of Werfenweng. Werfenweng (ca. 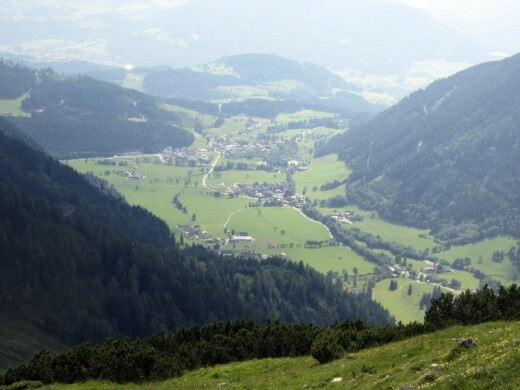 900 residents) lies at the foot of the Tennengebirge, in the middle of Austrian Salzburgerland. Werfenweng is situated between 900-1000 meters on a south-facing plateau. It is easily reachable both by car (6km from the highway) and train (10km from Intercity stations Bischofshofen/Werfen). Werfenweng nevertheless gives the feeling of being far from the everyday bustle of the “populated world”. It has a charming village center with various hotels. The plateau is furthermore dotted with many tiny hamlets with cabins, farms, and boarding houses. Werfenweng is focused on providing convenience to tourists: the village center has a bank with ATM, a grocery store, sports store, and the tourist information office (VVV). The village also offers various dining options, with several restaurants, a pizzeria, a Konditorei (pastry bakery), and for the après-ski the VIP-Bar, Liftstüberl and Stroblhaus. Nothing is large-scale, further adding to the quaint charm of this cozy village. Werfenweng provides a world of possibilities for a fantastic holiday experience in both summer and winter.